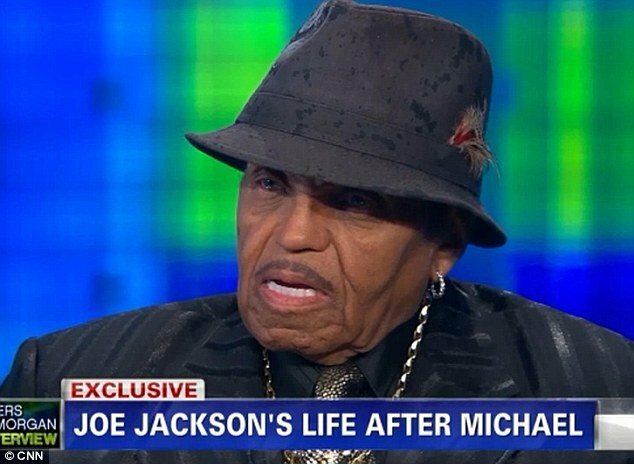 Speaking during Piers Morgan Tonight, which aired on Wednesday, Joe Jackson has admitted to physically disciplining son Michael and the rest of his family, claiming that he doesn’t regret “being tough”. Joe Jackson, 84, also claimed that he doesn’t believe that there’s any such thing as beating a child but that they “will remember” being punished. Although many of his children have spoken out about what they claim to have been an emotionally and physically abusive upbringing, Joe Jackson believes that he did right by his children. “I’m glad I was tough, because look what I came out with. I came out with some kids that everybody loved all over the world. And they treated everybody right,” he said. “There’s no such thing as beating a kid. You whip them or punish them over something they did and they will remember that,” Joe Jackson said when questioned by the British host. “I had to be like that way because during those times, it was hard, and you have a lot of gangs there, you know, in the area where we were living,” he added. Addressing Janet Jackson’s claims that she wasn’t allowed to call Joe “Dad” at any point during her childhood, he said: “You had all those kids running hollering around. They’re hollering, <<Dad, Dad, Dad>>, you know, and it gets to be – it sounds kind of funny to me. “The saddest part about the whole thing was Michael tried to reach me,” said his father.